Subsidence, or sinking, is becoming a big issue for coastal towns that are also dealing with the threat of rising sea-level. A sinking city becomes more susceptible to flooding over time, and knowing the rate of subsidence can help a city prepare for future floods. Jersey Village, a town just northwest of Houston, Texas, is experiencing subsidence. In the past, the city has monitored the subsidence with campaign-style GPS, meaning that a few time a year, GPS units are placed in the same locations to see how much that particular point has moved. The drawbacks to this technique are that it can be difficult to see very small changes in subsidence, and the record of motion is not continuous. 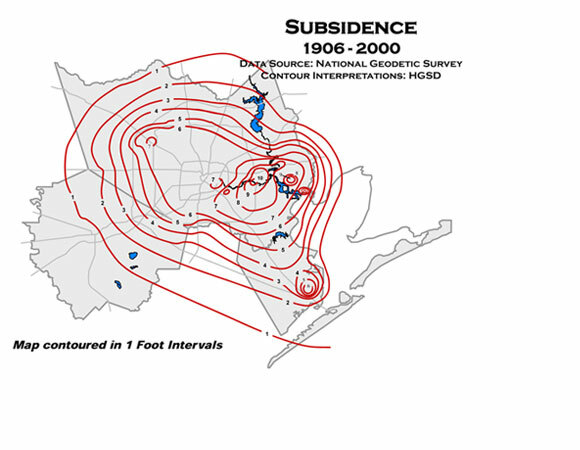 Toby Burrough and colleagues at the University of Houston are improving the city’s method of monitoring subsidence with four permanent and continuous GPS units. Continuous GPS units are installed permanently in a location and make a measurement every 15 seconds, which is then averaged into a daily value. This will allow Burrough to see changes in the rates of subsidence over short time periods, as well as very small amounts of subsidence (less than a few millimeters). Burrough plans on combining the GPS data with other information about water in the area, such as ground water movement and weather data, to see how these variables may affect subsidence. Figure 1. 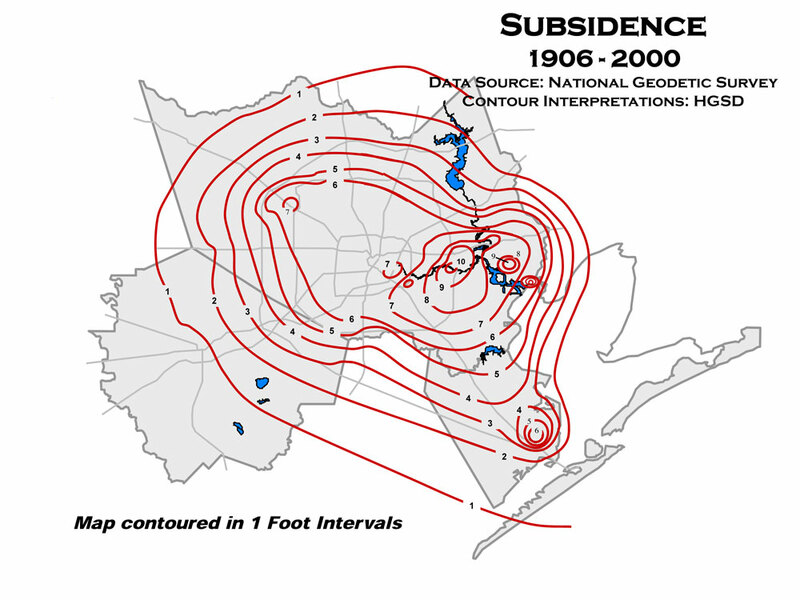 Subsidence Contour Map 1906-2000. Map contoured in 1-foot intervals. Data Source: National Geodetic Survey. Contour Interpretations: HGSD. Geologists Find Parts of Northwest Houston, Texas Sinking Rapidly. Science Daily. Sep. 28, 2010.